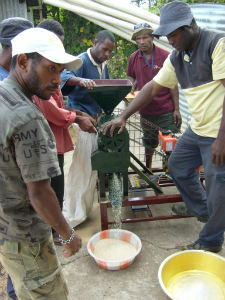 The Christian Leaders Training College (CLTC) in Papua New Guinea has been running a rice growing training programme since 2006 and as part of this programme they were keen to install a rice mill so trainees could also learn how to mill the rice they were growing. Lawrence Williams is a New Zealand missionary and development consultant who has worked in PNG and elsewhere since 1972. He has a degree in agricultural science and taught agriculture at CLTC for 11 years in the 1970's before moving to South East Asia. In 2006 he returned to Papua New Guinea and established the Rice Growing Training Programme (RTP) at CLTC to help meet the needs of the people. PNG imports approximately 150,000 tonnes of rice annually and with prices doubling due to the worldwide economic crisis, there is huge opportunity and need now for farmers to grow more rice for the nation’s food security. 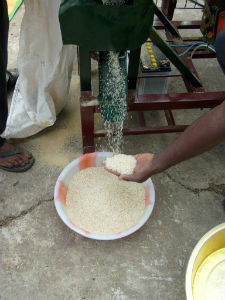 The Rice Growing Training Programme is starting to meet that need and in 2009 will produce at least 30 tonnes of rice. However, knowing how to grow rice alone is not enough. The rice also needs to be milled and so Lawrence is now concentrating his efforts on getting rice mills into remote villages. The mill at CLTC will be used not only to process the rice grown at CLTC but also to train people there who can then go back and use the mill in their villages. CLTC directly trains approximately 10 people each year in rice growing skills and techniques, with many more learning the same skills by observation. These people will now also be taught how to use the mill therefore indirectly thousands of people will benefit from this mill as when these trainees return to their villages the value of their training will be huge. Villagers will now have an opportunity to participate in farming rice for themselves to eat but also to increase their cash income leading to a better quality of life. Rice growing is taking off among the villagers around the College and along the Waghi Valley and elsewhere. People like to eat rice and it is in high demand so this project is spreading rapidly. Many farmers are getting into production now. CLTC is seeking to address the real needs of the people in PNG. In Papua New Guinea some 37% of the people live below the poverty line. Rice is such a staple food and the climate in PNG is suitable for growing it - as there is no winter they are getting into a pattern of planting a paddy field or two every month and therefore are harvesting every month. The local farmers are the beneficiaries, as well as the consumers who can get rice cheaper than imported rice. The storekeepers and carriers also benefit. It has fostered a real sense of partnership and support from the local communities in the valley and elsewhere. It will continue to grow. Reuben Meiyao is the farm manager at CLTC and oversees the rice growing training programme. He initially received training in agriculture at CLTC and in 1986 he attained his Certificate in Agriculture. After working in various capacities he returned to CLTC as farm manager n 1994. A busy man, he carries big responsibilities. Elijah Meriba was trained in rice growing in PNG and in Japan. After instructing trainees for 10 years he is now the training manager. Although Lawrence Williams now lives in New Zealand he regularly visits PNG to encourage and assist. To equip village people with the skills and training necessary to not only successfully grow rice but also to be able to mill, package and sell their rice. The cost of this mill is US$2,227. 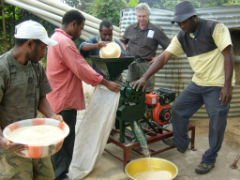 Orewa Community Church in New Zealand has provided the funds required for this mill.